Prime Minister, the Most Hon. Portia Simpson Miller (second left), shares a special moment with Digicel executives during the 10th anniversary launch of the Digicel Foundation on January 15 on the grounds of the Stella Maris Foundation, St. Andrew. From left are Chair, Digicel Foundation, Lisa Lewis; the Foundation’s Executive Director, Samantha Chantrelle; Regional Chief Executive Officer, Andy Thorburn; and Chief Executive Officer, Digicel Jamaica, Barry O’Brien. 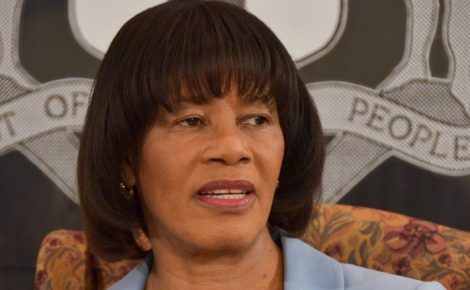 Prime Minister Simpson Miller urged communities to “stop covering the wrongs”, noting that they have a “big role” to play in the crime fighting effort. 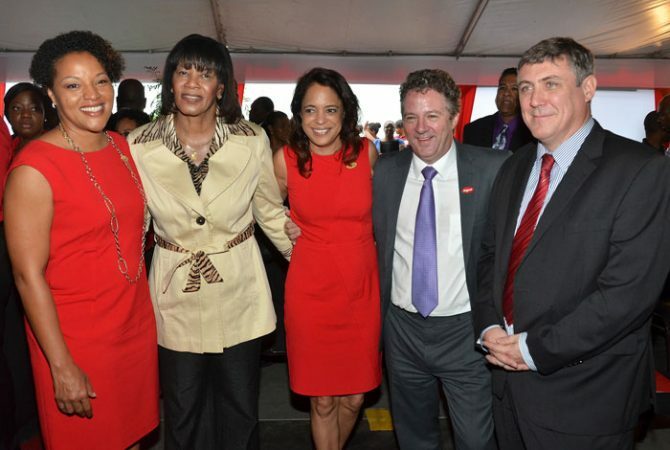 The Prime Minister was delivering the keynote address at the Digicel Foundation’s 10 anniversary launch. The Prime Minister commended the Digicel Foundation for its collaborative approach and commitment to national development. Prime Minister, the Most. Hon. Portia Simpson Miller has called on all Jamaicans to unite in the fight against crime. She urged communities to “stop covering the wrongs”, noting that they have a “big role” to play in the crime fighting effort. The Prime Minister was delivering the keynote address at the Digicel Foundation’s 10 anniversary launch on January 15, at the Stella Maris Foundation in St. Andrew. “It is also critical at this stage of our nation’s development to encourage a new national initiative that promotes volunteerism even as we thank the thousands of volunteers, who give of themselves selflessly across Jamaica every day. We talk about building Jamaica. We talk about what is not going right and we talk less about what is going right, like what happens here this morning. … it is the responsibility of all of us to unite to get it right in this country,” she stated. “On this your 10th anniversary, thank you and I want to encourage you to continue and make your contribution. Your benevolent approach, your exemplary corporate citizenship and corporate responsibility, continue to go a far way in assisting to build human capital and help our nation grow and develop,” she stated. To celebrate its 10th anniversary, Mrs. Lewis said that the Foundation will continue to work with schools across the island to create centres of excellence for special needs students, bringing the total number of facilities to 10. She also informed that 10 schools will be equipped with mobile science carts for the enhancement of scientific study at the secondary level, while the enrichment programme in schools will be expanded to 64 institutions. Also this year, the Foundation intends to stage a 5K run/walk for special needs as well as a 10K inspiration run.